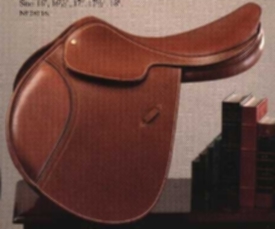 THE ASHLAND II SADDLE. An elegantly designed close contact saddle. Deeper seat than the original Ashland. Made with hide seat and hide knee pads. Embossed cowhide leather in our rich Newmarket color. Size: 16, 16 1/2, 17, 17 1/2, 18. No. 28116 Call 203-557-3285 for best price!